April 21, 2013 0 comments on "New York City’s 20 Most InDemand Employers"
Linkedin’s rankings just got more interesting. Last year, They shared the world’s Most InDemand Employers, along with sub-lists for specific countries and functions. 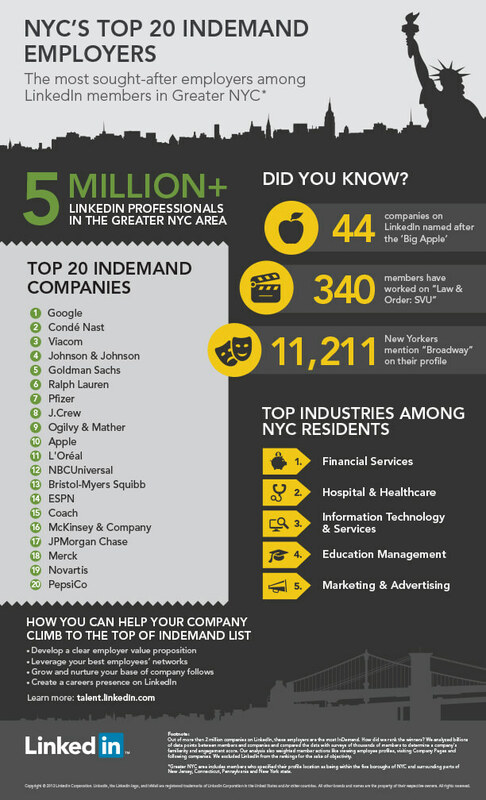 Now Linkedin is taking their own insights down to the city level and on 18th April 2013 at Connect in New York, they announced the Big Apple’s rankings. So where do New Yorkers most want to work? Based on LinkedIn’s massive data set – and the actual actions of over five million professionals residing in the New York area* – here’s a snapshot of the city’s professional landscape and its most desirable employers. Did your company make the list? Infographic by Linkedin.